My favorite paper from the 2012 Holiday Catalog was the Festival of Prints DSP stack. There were so many fun and beautiful papers in the stack that I had to order a 2nd stack just to make sure I’d have some for my 2013 Christmas cards. I also loved the Mitten Builder punch and had to have it. So, naturally, when I had a Christmas cards class, I used both of these for a fun card. Something you will probably notice after a few posts is that Cherry Cobbler is my bestest friend among the Stampin’ Up! colors. If they ever kill it off at the end of the season, there will be sackcloth and ashes and gnashing of teeth — like when they cancelled Firefly. Red is one of my favorite colors (current favorite color changes depending on my mood and the season), and this is what I consider a perfect red. Not too bright, just the right amount of deep, but not bordering on maroon or burgundy. So I use Cherry Cobbler a LOT. My card base is Cherry Cobbler. I adhered a background from the Festival of Prints stack, then stamped my sentiment in Island Indigo (another of my favorites, I will cry when they retire it at the end of May). The reason I stamped before adding all of my punchouts and accessories is because I’ve learned the hard way that if I wait and stamp at the end, I may have to redo the entire card when I stamp my sentiment crooked. I do that a lot, probably for the same reason that I was never a good infielder in softball — I’d keep my eyes on the ball until it was close enough to hit me, and then I’d close my eyes and hope the ball magically found its way into my glove. I was a serial flincher. I’m the same way with stamping — I’ll watch where I’m stamping until right before the ink hits the paper, and then I’ll blink or flinch and just hope I get the sentiment where I want it. It’s probably why I prefer to stamp and then punch out my sentiments; I can keep adjusting the paper in the punch until it’s straight, and since I can lightly clamp the paper with a punch to hold it in place before I punch, I know I’ll punch correctly since it won’t matter if I look away when I pull the trigger. Next, I added the silver glimmer paper (another favorite), which was trimmed using one of the Finishing Touches Edgelits dies and the Big Shot. 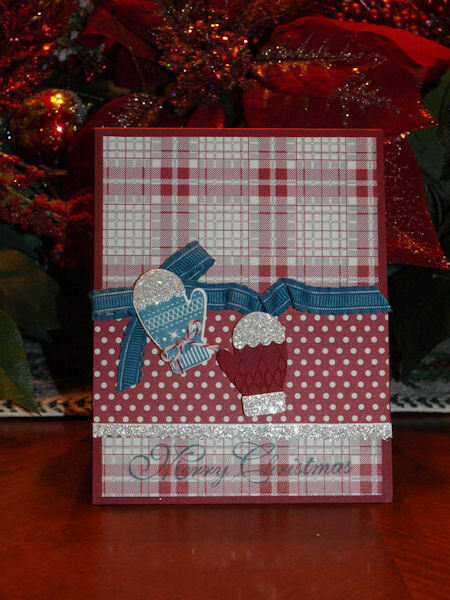 In another version of this card, I instead used the other Finishing Touches die to trim a piece of Cherry Cobbler cardstock. I adhered this to the background paper first. *Note*: Before I trimmed the paper with the die, I adhered the back of the paper to a Big Shot Multipurpose Adhesive sheet, then ran the paper and die through the Big Shot. That way, when the trim was cut, it acted like a big sticker, and all I had to do was pull off the sticker backing and put the sticker on my card. It’s much easier than trying to run adhesive along the back of such a small piece of paper. A lot less messy, too! Then I added the strip of polka-dotted paper (also from the Festival of Prints) and adhered it just overlapping the silver glimmer paper. Next, I tied a 10-inch piece of Island Indigo Ruffled Ribbon (yeah, I want to marry this ribbon — or hoard it) in a bow, leaving a long tail on the right side of the bow and a shorter tail on the left side. I adhered the bow and left tail with glue dots at the top edge of the polka-dotted paper, then wrinkled and glue-dotted the right tail across the top edge of the same paper. I stamped the mitten from the Chock-Full of Cheer stamp set in Island Indigo ink on Very Vanilla cardstock, then punched it out with the Mitten Builder punch. Then I tied a piece of Cherry Cobbler Baker’s Twine in a small bow and trimmed the ends short. I glue-dotted the twine to the wrist of the mitten. Punched out two mitten tops and one mitten cuff in Silver Glimmer paper and adhered one of the tops to the stamped mitten using glue dots (I’ve also used Sticky Strip for this, and it works great). I glue-dotted the Island Indigo mitten to the center of the bow, then stacked 3 dimensionals under the cuff of the mitten so the mitten wouldn’t come off looking all smushed. I punched the 2nd mitten out of Cherry Cobbler cardstock, then ran it through the Big Shot in the Argyle embossing folder. I LOVE this folder for anything Christmas-related, because it gives a little of that old-fashioned Christmas-y feel. Also anything clothing-related. I used glue dots to adhere the silver mitten top and cuff, then used 6 dimensionals (3 stacked under the top, 3 stacked under the cuff) to add the mitten to the card.